寫在窗框的詭話 (The Uncanny on the Frame). Hong Kong: Infolink Publishing, 2013. 247 pp. Inside the northeast corner of Beijing’s Second Ring Road is a red lantern-lined stretch of avenue crammed with twenty-four hour restaurants the city’s foreigners sometimes call “Ghost Street.” But while it’s pronounced guijie, it’s not written with 鬼 , or “ghost,” but 簋街 , for a ritual vessel that held grains in the Bronze Age. Though rumors have circulated that the street name originally referred to ghosts, and was later softened to thegui meaning “bronze ritual vessel,” I don’t expect we can ever know for sure. Guijie, then, is a kind of guihua 鬼話 , or deceit—and in this case, we can’t even be sure which gui is deceiving which. 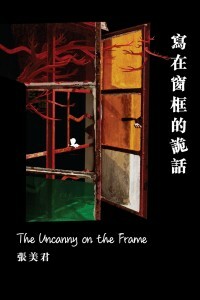 The Chinese title of The Uncanny on the Frame 寫在窗框的詭話 , a collection of essays, vignettes, and belles-lettres by Esther Cheung 張美君 , professor of Comparative Literature at the University of Hong Kong, plays a similar joke. The key word of the title, guihua 詭話 , does not show up in my dictionary, but the fact that the cover page is bilingual grounds the Chinese word in the English “uncanny,” or Sigmund Freud’sunheimlich, his term for something at once familiar and incongruous, often resulting in cognitive dissonance (it is often translated into Chinese asguimi 詭秘 or guiyi 詭異 ). That fact that it is a homophone for the guihua that means deception allows it to compel its own cognitive dissonance, in that it is both familiar and strange at once. There is also something unsettling about my review beginning with a reference to Beijing, and to my use of Pinyin to represent the Chinese words’ pronunciation in Mandarin. Cheung’s book, which collects essays mostly published in the newspaper Mingpao Daily 明報, is resolutely about the Hong Kong experience. 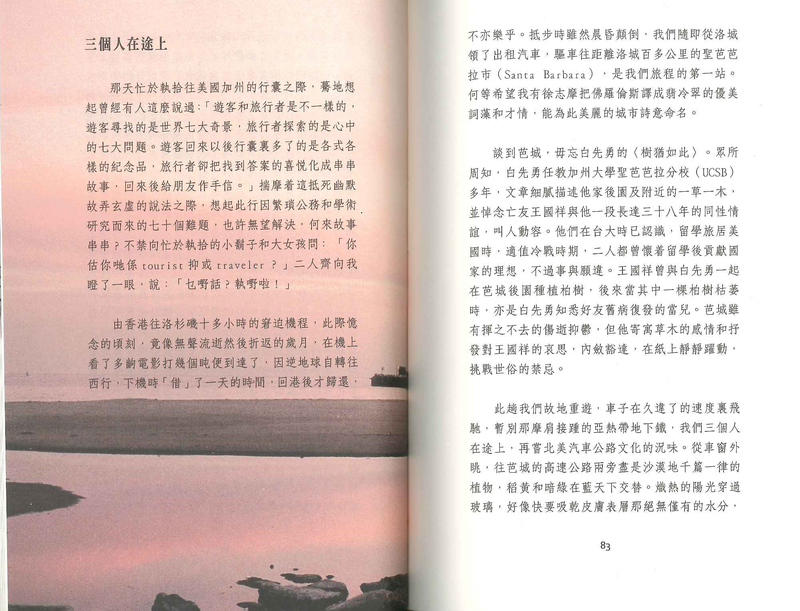 In fact, if there is a thesis to the pieces collected here, it finds expression early on in a sentence in the essay “Reading Frames, Reading Books” 看框 · 看書, where she writes, “If Hong Kong is a book, then it has countless authors and an infinite number of chapters, ranging from the critical to the lyrical, from imaginary flights of fancy to rational analysis, varied and various as window frames, and equally defining and delimiting the states of our existence” 如果香港是一本書，它有無數的作者和不盡的篇章，從批判到抒情，從天馬行空到理性分析, 跟窗框一般五花八門, 界定我們的生存狀況 (12). While the trope of reading a city like reading a book may be a familiar one to academics, and fits a renowned scholar in film and cross-cultural literary studies such as Cheung, The Uncanny on the Frame is not a monograph or collection of academic articles. This is not to say that the pieces, though I referred to them as belles-lettres above, are not intellectual; rather, they serve as popularizations of key notions of academic inquiry as applied to global culture circulating through Hong Kong. They offer the insight of an expert in the intricacies of cultural studies to a broader range of readers who might be at once curious about the analysis of their surroundings and put off by the jargon or assumed background in the canons of critical theory many academic essays require. In a city too often derided as a “cultural desert,” this is a testament to the broad base of cultural and intellectual curiosity in Hong Kong. Page from Cheung’s The Uncanny on the Frame. A common move in these essays is to begin with the personally anecdotal, relatable to most who live in or near a globalized city, segue into a brief reading of literary theory and art in terms of the anecdote, and end with a personal recollection that brings the conclusion into relevance for an individual’s life. In “Postmodern Waste” 後現代的廢物, for instance, Cheung begins describing a friend’s emergency operation during labor, moves on to Julia Kristeva on abjection, and then to Ridley Scott’s 1982 Blade Runner in terms of Post-Fordism before being reminded of an unfinished letter to a deceased friend, the thought of whom causes her to vomit (96). And in “Three on the Road” 三個人在途上 , as pictured here, we see the postmodernism inhabiting the layout and the writing itself, with the superimposition of image and text, and the text itself peppered with bits of multilingualism. In fact, the multilingualism is greater than it appears, since amidst the Standard Written Chinese (based on Mandarin), there is also vernacular Cantonese: “‘Do you think of yourselves as tourists or as travelers?’ The two of them stared blankly at me, and said: ‘What are you talking about? Get packing!’” 「你估你哋係 tourist 抑或 traveler ？」二人齊向我瞪了一眼，說:「乜嘢話？執嘢啦！ 」 (82). Most of these essays take up only a few pages, and would be good to assign to undergraduates in advanced reading classes as examples of how intellect and wit are at work and at play in and around hybrid, de-centered worlds of non-standard speech and traditional Chinese characters. Students and scholars of film will be especially interested in Cheung’s ruminations on global cinema, and particularly her thoughts on Hong Kong movies under the section heading “Memories of Shadow and Light” 光影記憶. Hers may be one of the first books to include a discussion of Wong Kar-wai’s 王家衛 2013 film The Grandmaster 一代宗師. Referring to its tagline, translated in the movie as “Kung-fu comes down to two words: Horizontal, Vertical” 功夫，兩個字，一橫一豎, Cheung asks, “Is film not a binary opposition between a success and failure dependent on the interrogation of various characters?” 電影不是多番透過不同的人物質疑成敗的二元對立 ? (185). Her answer uses the binary to deconstruct the binary: “Beyond horizontal and vertical, yin and yang, or victory and defeat, is kung-fu anything but an indeterminate allegory?” 那麼在橫豎、陰陽、勝負以外，功夫不就是一個不固定的寓言 (allegory) 麼 ？ (186). Just as she proposes Hong Kong as a book of many chapters written by many hands, she reads kung-fu, Wong’s oeuvre, and kung-fu in Wong’s oeuvre as an interlaid text of its own: “Kung-fu as a text in Wong Kar-wai’s hands repeatedly frustrates its readers, because of its ambiguous storytelling style and the way its narrative structure makes history into an abstraction, but it is also what so many of his fans delight in” 功夫作為文本在王家衛手中是叫閱讀者多番沮喪，因為他那曖昧的說故事風格和把歷史抽象化的敘事結構, 但也叫不少粉絲津津樂道 (186). Cheung’s deconstructions, of course, are not only about Hong Kong or cinema. In “A Hongkonger’s Exodus Out of Egypt” 香港人出埃及記 (194-201), she refers to Italo Calvino’s Invisible Cities (which is imagined as taking place in China, and which inspired Atlas: The Archaeology of an Imaginary City 地圖集: 一個想像的城市的考古學, by Hong Kong writer Dung Kai-cheung 董啟章), the 2004 Jia Zhangke 賈樟柯 film The World 世界, and the Rosetta Stone. This is a kind of linking up with the world (yu shijie jiegui 與世界接軌), a phrase that has taken some attention as conscious policy of the PRC in recent years (often via the window of Hong Kong), but which has been going on throughout Chinese history. Jiegui is not guijie, but it does exude a ghostly presence throughout the collection. Cheung’s vision represents a particular version of that linking, a response to economic globalization in a cultural connection framed around Hong Kong as uncanny window, through which the world appears both incongruous and familiar at once.